National, February 06, 2017: Cargill Foods India, a leading FMCG company has decided to fight against one of the major scenarios in India – Counterfeit Products. Addressing the impact of counterfeiting in India, Cargill Foods India announced initiatives to combat it at an event held today in Delhi. In the commodity business, where brands play a vital role of defining the product differentiation, a counterfeit tarnishes the faith of a customer. According to a study by KPMG-FICCI, about 80 per cent of the consumers are victims of deceptive counterfeiting, i.e. they buy fake goods in the belief of buying genuine ones. While consumers end up paying excessively for low quality products that could possibly have health and safety risks, producers risk damage to brand image. Cargill Foods India believes in nourishing the world in a safe, responsible and sustainable way and follows global standards around food safety. Cargill Foods India strongly condemns counterfeiting and is making all possible efforts to eradicate the problem from its roots. Hence, it has introduced new-age anti-counterfeiting technology in its products. 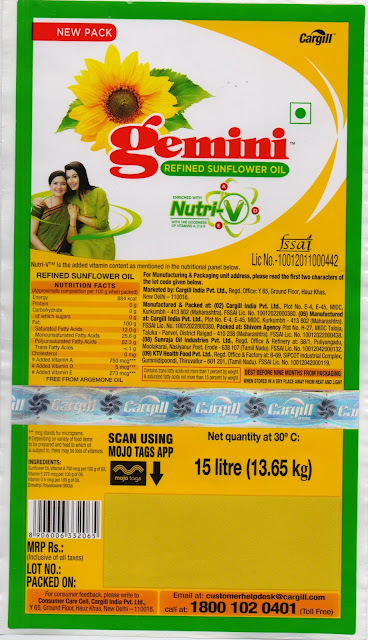 One of its popular regional brand - Gemini Cooking Oil is a market leader with 27% share in Maharashtra. To begin with, the initiative against counterfeiting has been launched on this brand. This anti-counterfeiting technology has a unique feature with a two-way process to check the authenticity of the Tin SKU. This process includes a 3D Hologram of Cargill Foods India which signifies the authenticity of the product. On looking at this hologram using the phone’s torch light, one can see ‘1865’ written – the year of foundation of Cargill Foods India’s operations. Besides, the customer can download an app called ‘Mojo Tags’ to scan batch code of the product and receive the reassurance of the genuineness of the product. This is the first time an edible oil brand in the country is making use of technology to fight the problem of counterfeiting. In the coming months, Cargill Foods India will educate the consumers with its various programmes on counterfeiting. Further, the company also plans to take necessary legal action against counterfeiting and getting the cases registered. About Cargill Foods India: In India, Cargill Foods India’s operations started in 1987. It has businesses in refined oils, food ingredients, grain and oilseed sugar, cotton, animal feed and trade structured finance. Cargill markets leading consumer brands of edible oils such as Nature Fresh, Gemini, Sweekar, Leonardo Olive Oil, Rath and Sunflower brand of hydrogenated fats in India. Cargill also markets Nature Fresh brand of packaged wheat flour. It employs more than 2,000 employees working across offices and plants and a network of warehouses and depots. About Cargill: Cargill provides food, agriculture, financial and industrial products and services to the world. Together with farmers, customers, governments and communities, we help people thrive by applying our insights and over 150 years of experience. We have 150,000 employees in 70 countries who are committed to feeding the world in a responsible way, reducing environmental impact and improving the communities where we live and work. For more information, visit Cargill.com and our News Center.